What I like to do is whip up the dressing and let it rest in the fridge for a day or two. It is SO SO good once all the flavors have melded. Then, I combine all my greens and chickpeas in one bowl and keep my nuts and pomegranate seeds stored separately. This way, I can throw together a salad easily during the week but I can also use the components in other dishes as well. 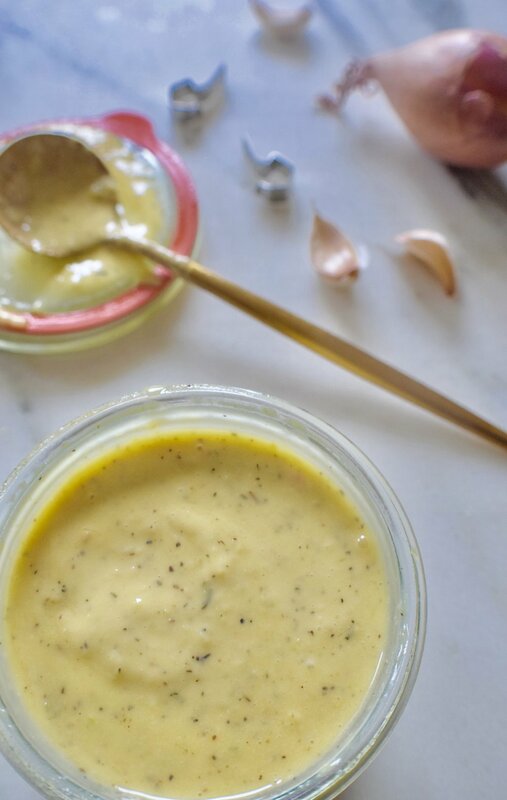 The Lemon-Garlic Sauce is simply the best to have around! It is DELICIOUS on sandwiches, is perfect for dipping fresh veggies in (my go-to veggies are endive and radishes), and tastes really fantastic on avocado toast! Finally, the toasted hazelnuts and pomegranate seeds are great to munch on all on their own! Or can finish off any savory dish. I rarely have extra of these two anyway as I always load them up on my salad! If making this salad for Thanksgiving, make all components a day or two ahead of time so you can just toss them together the day of. I recommend dressing right before serving. You can also let guests dress their own salad - that way if there are leftovers, you can easily store them for future use (rather than have soggy greens). 1. Place all dressing ingredients in food processor and mix on high to combine. Transfer dressing to airtight container and refrigerate overnight to allow flavors to meld. The next day, taste test and season more if you see fit. 2. Using food processor, finely shred Brussels sprout halves. Place shredded Brussels sprouts in medium bowl. 3. 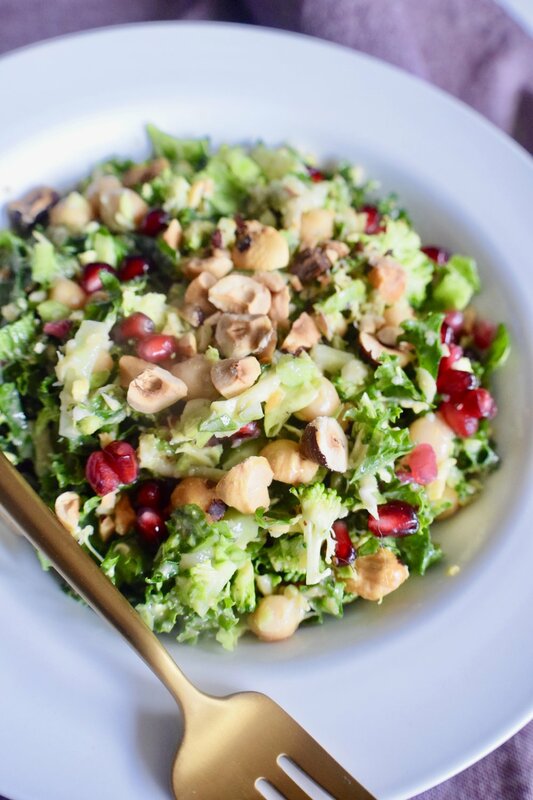 Add broccoli, kale, chickpeas, pomegranate seeds, and hazelnuts to Brussels sprouts. Fold to combine. 4. Dress salad 5 to 10 minutes before serving. Not all dressing is needed – use as little or as much as you want! Leftover dressing can be used for sandwiches, other salads, on fried eggs, or as a dip for veggies.